Is there a way to display .md files offline so we know what it will look like once it's uploaded in Github? I'm referring to showing the README.md file as it would come out in Github, and not as for editing purposes. Needs to work on Mac and Windows since I use both. There are a few Chrome plug-ins that work well. I've been using Markdown Preview Plus. After install, enable "Allow access to file URLs" in Extensions (menu > More tools > Extensions or enter URL chrome://extensions/ instead). Then drag-n-drop a Markdown file onto Chrome and use your favorite editor to edit. Pass -h for additional help and options. Hope this helps. Check it out here. Atom by Github. Gives you a side by side preview. Late to the party, but have a look at MarkdownPad. Visual Studio Code - the new editor by Microsoft also provides very good support for markdown editing. 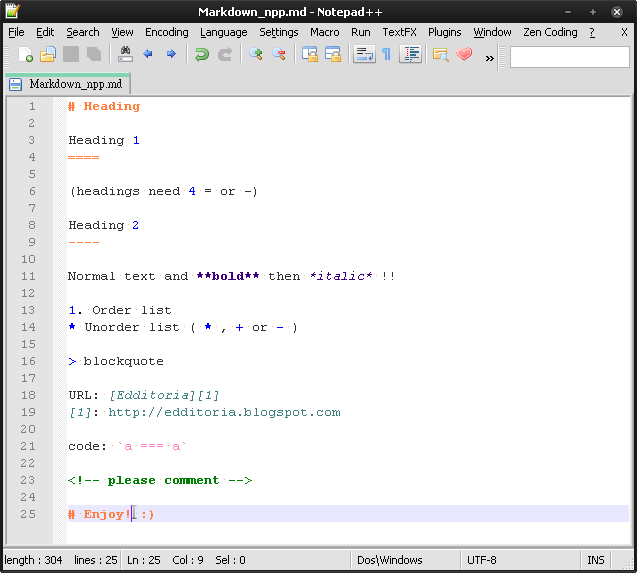 The editor provides good support to toggle between the markdown code and the preview mode. It also provides reasonably good intellisense support for all the markdown syntax. The editor is free for use and is also cross platform (works on Linux, Windows and Mac). I created this to build a tool for sending code reviews, it is easily extensible, by importing it as a module you can add custom actions. I just installed https://github.com/ypocat/gfms. It does a very good job rendering github flavored markdown. 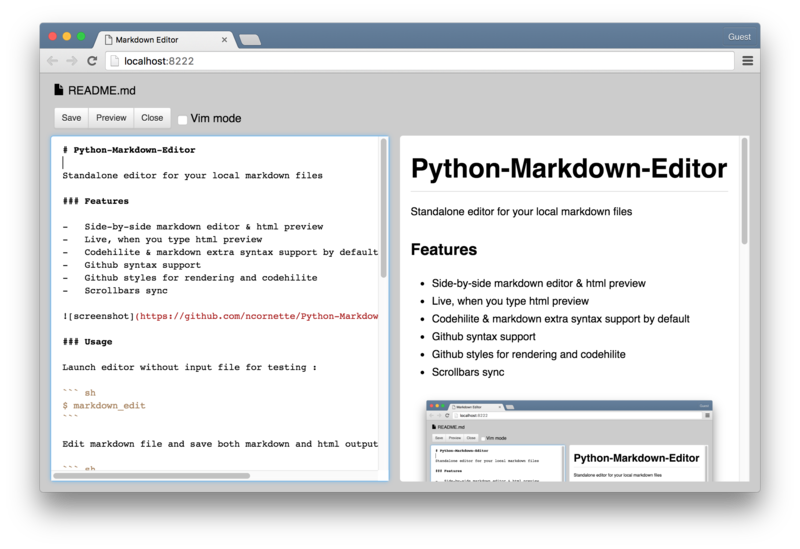 It detects changes in your markdown, so you just put your browser and editor side-by-side. It is Node.js, so it should work fine on any platform. There are people who does not use Google Chrome. 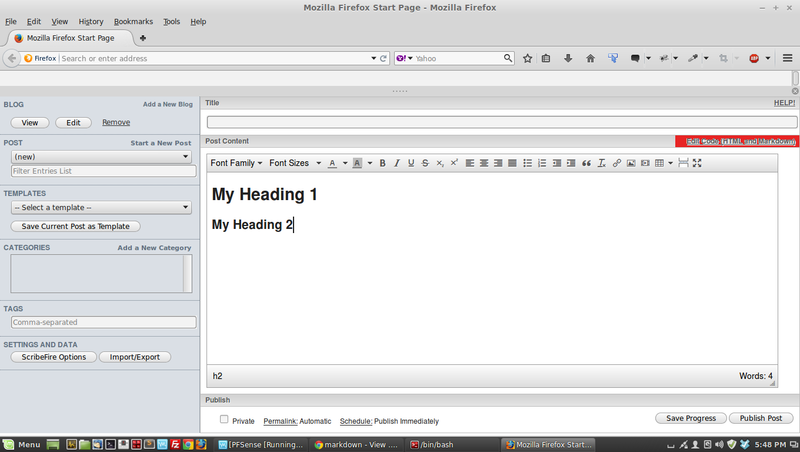 There is a Firefox add-on called Markdown Viewer which is able to read Markdown files offline. MarkView is a Chrome extention for editing and viewing markdown file with an outline view, support multiple table format styles, code block syntax highlight and Github Flavored Markdown. 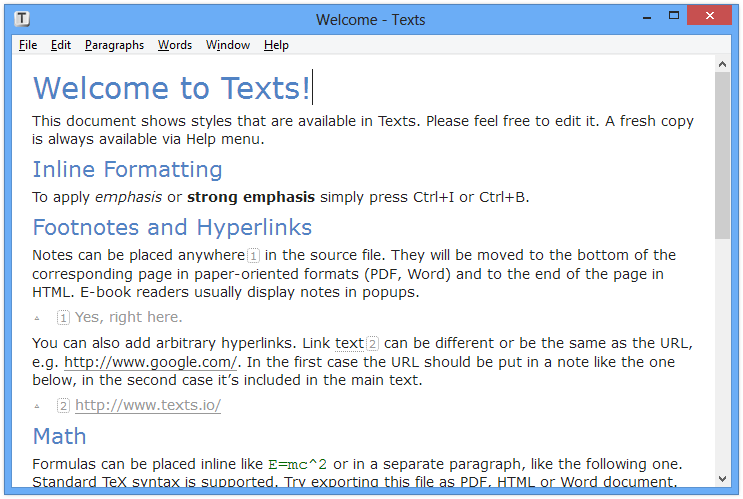 Editing and Viewing markdown file in web page style. Responsive: when the window size small than 940px, outline section will automatically hidden; resize bigger than 940px, outline section will display. MarkView will view all markdown files except those under raw.github.com because that subdomain only displays the source. I like the vertical splitter in Downmarker, you can see the changes as you write! You can use texts as a md viewer and md editor, its lightweight and neat. Geany has a plugin for markdown which does a fair job, giving you also a Markdown preview in the sidebar. It also runs on Linux, Mac OS X and Windows. To use it, install geany, then install the package geany-plugin-markdown and select it from the plugin manager. I just coded up an offline markdown viewer using the node.js file watcher and socket.io, so you point your browser at localhost and run ./markdownviewer /path/to/README.md and it streams it to the browser using websockets. There is also StackEdit. It will work both online and offline (it uses your browser local storage). You can also connect it with Dropbox or Google Drive to see files hosted on the cloud. If you're a vim person, you can try the vim-preview plugin. Simply install it into your ~/.vim directory with your method of choice. Then you can open a Markdown file with vim and use the command :Preview which will open a new window in your browser and display the end result. Strapdown.js makes it embarrassingly simple to create elegant Markdown documents. No server-side compilation required. and opening in any browser will show rendered HTML. Added bonus: you can easily change the theme. For MAC I use Marked, for Windows I use Muto-Mark. Both support the GH stylesheet. For OS X, Mou is very nice, and it comes with two GitHub CSS themes. Check out Haroopad. 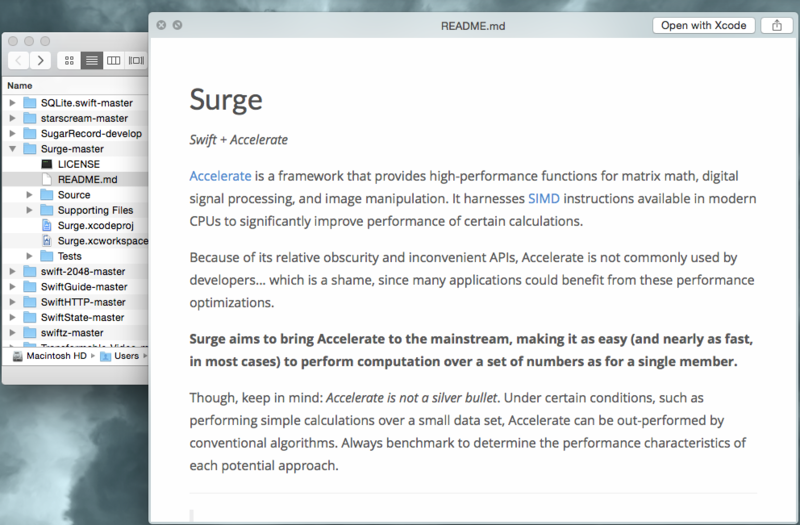 This is a really nice #markdown editor. It is free and available for multiple platforms. I've tried it on Mac OSX. One of the simplest resources that works well on MacOSX is the Markdown Quick Look plugin found at InkMark. After installing this on OS X 10.9+, you simply select a markdown file in Finder and tap the space bar. I am not certain if the results are correlated 100% with Github but they are pretty good and make for a tiny unobtrusive offline viewer only solution. Mashable also wrote an article on 78 different tools if you'd like other options. Nothing to install! Cross platform! Cross browser! Always available! Disadvantages: could be hassle for large files, standard cloud application security issues. From now I use http://marxi.co/. Marxi.co has online and offline version. RStudio can handle markdown files and convert them into html and pdf. If you already have it, you can use RStudio (it is an IDE for R programming language). It is free and open source, and works on Windows, Mac and Linux. You may use Scribefire Next. It's a Mozilla Firefox browser plugin. Just install the extension and fire up Firefox. Customize your toolbar and place the Scribefire shortcut to it. And since it's a browser plugin, you can use it in Mac, Linux and Windows. When you want to write in Markdown mode, just click Edit Code from the Scribefire window. Now to meet your purpose, go to Edit Code mode and copy all the texts and paste it to your .md file and upload. There is no live preview feature for this, you have to toggle Edit Code and Edit Visually to preview your text. It's year 2014, need to add some other awesome tool here for other readers and researchers. Just recently used Brackets + Markdown Preview Extension. The popular Web Essentials plugin for Visual Studio offers a Markdown viewer and editor. It also supports the Github language syntax for adding code snippets. http://cloose.github.io/CuteMarkEd/ (I have just tried it briefly, and it seems to work fine). Not the answer you're looking for? Browse other questions tagged github markdown viewer or ask your own question. What file uses .md extension and how should I edit them? 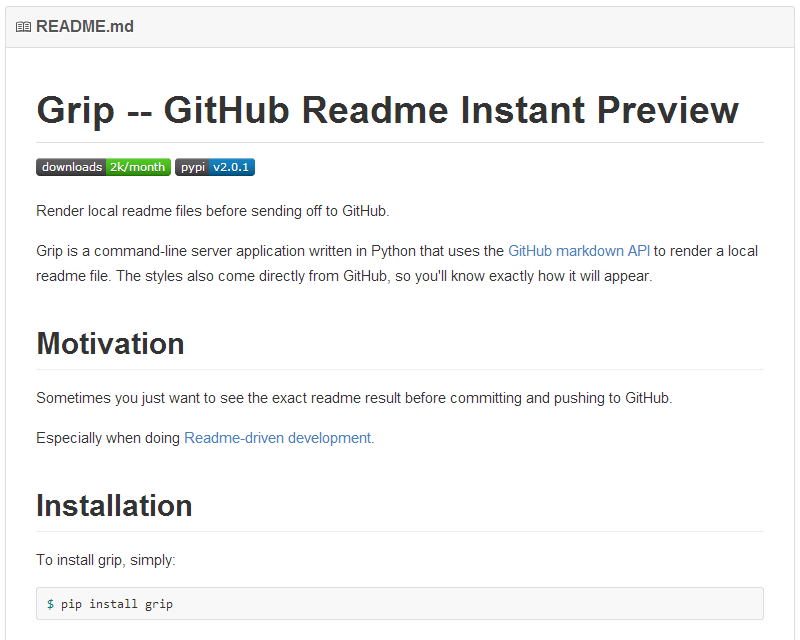 How to make my Perl module's README file compatible with Github's Markdown display?